Awesome experiences for kids, parents, and even grandparents. Richmond is full of fun activities like go-karting, bubble soccer, and whale watching—along with plenty of cool parks, historic sites, and museums to explore. All are sure to get the kids off their devices and having a blast. And even parents often find themselves enjoying Richmond’s kid-friendly attractions (now that’s a win-win trip)! Read on for some great ways to keep the family entertained during your next visit to the city. Richmond has a number of fun, immersive parks your little ones will love. The amazing Terra Nova Adventure Play Environment features a seasonal maze, treetop playhouse, double zipline, hammock swings and trampolines, and beautiful natural habitats. Perhaps Richmond’s most unusual green space, this park is tucked just beyond the fence of the South Runway at Vancouver International Airport. And while it’s a great place to airplane-spot (there are excellent information panels featuring identification tips), kids also love climbing its giant, dome-shaped globe centrepiece and running (or cycling) along its runway-like pathways—complete with lights and markings. An ideal destination for young wildlife fans, a visit to the Richmond Nature Park should start with the Nature House, a kid-friendly interpretive centre that illuminates the region’s flora and flora with plenty of hands-on displays. Save time to take the family on some of the park’s tree-lined trails—which wind through a remarkable peat bog habitat—and keep your eyes peeled for squirrels, birds, and dragonflies en route. Kidtropolis is an indoor, interactive mini city for kids aged 2 - 10, where they can use their imaginations to become firefighters, police officers, teachers, stage performers, and more. It&apos;s the perfect place to bond with your family by participating in pretend play together. And when it&apos;s time for a break, the on-site Munchies Cafe provides a variety of options for kids and adults alike. The Gulf of Georgia Cannery National Historic Site presents a great opportunity to explore what was once the largest and busiest of the West Coast seafood canneries. 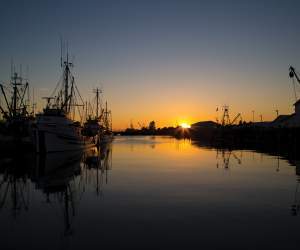 It&apos;s packed with kid-friendly exhibits and activities—kids can haul in ‘salmon’ with a hefty hook, steer a fishing boat in a recreated wheelhouse, and dress up as if they were a yesteryear cannery worker. Nearby, the Britannia Shipyards National Historic Site offers an interesting glimpse into British Columbia’s seafaring past. A preserved fishing and shipbuilding village lined with vintage wooden buildings that look as if their residents have just stepped out, kids will be enthralled and engaged by this evocative heritage site. History of a different kind is on the menu at the Richmond Olympic Oval, a dramatic riverfront landmark. The city’s 2010 Winter Olympics venue houses Canada’s only official Olympic Museum, where your kids experience the thrill of the winter Olympics through realistic sports simulators. A must-see for young sports fans, there are additional activities and facilities for all ages at the Oval.. The Riverport Sports and Entertainment Complex features Watermania, a skating arena, Lucky 9 Lanes, a movie theatre featuring one of the region’s only IMAX screens, and so much more. Kids can enjoy everything from waterslides to a wave pool (complete with interactive features) at Watermania, which also features springboards, a five-metre diving tower, and a 50-metre competition pool for serious swimmers. And over at Lucky 9 Lanes you&apos;ll find a bustling gaming arcade along with 28 10-pin and 12 five-pin bowling lanes. There are hearty wood-fired pizzas on the menu at Lucky 9 Lanes, once it’s time for a family fuel-up. Older kids will love Apex Adventure Plex, simply because there’s so much to do! They can try some bouldering or bubble soccer, and there’s even a ninja obstacle course for them to navigate—along with an excellent trampoline park that has zones for all abilities. If your kids are really keen to see BC wildlife, book ahead for a memorable whale watching adventure. Richmond’s two main tour companies operate from April to October, guiding excited passengers out to the open water. Along with whales, you may have a chance to see sea lions, seals, and shorebirds during your tour as well. One of the region’s best cycling cities, Richmond’s relatively flat topography makes local biking accessible to all ages and skill levels. Rent wheels for the whole family from Steveston’s Village Bikes, then head out on some of the more than 80km of dedicated trails that stripe the city, ranging from shoreline routes to city-crossing pathways. Many trails follow and connect to historic sites, parks, and scenic stops, with ample places to take a break. The city’s biggest annual events are family-friendly and each of them typically offers plenty of activities for kids. Consider attending the Richmond Maritime Festival, Richmond World Festival, and the Steveston Salmon Festival and Canada Day celebrations for a fun-filled time. And you can always visit our Events Calendar to get the scoop on what&apos;s happening in Richmond—there are usually some great kid-friendly events happening for holidays such as Family Day (February), Spring Break (March), and Easter.